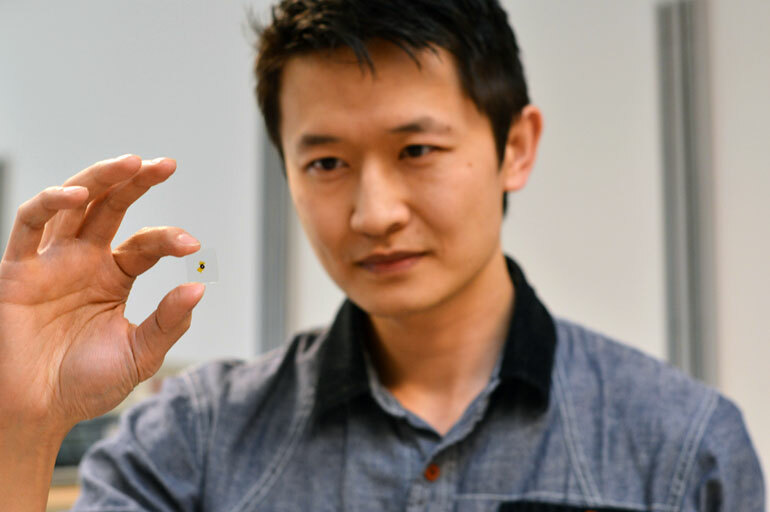 UBC's Kenneth Chau holds a glass sample used in his latest research, which proved that putting thin layers of metal over glass increases light transmission. Imagine if the picture window in your living room could double as a giant thermostat or big screen TV. A discovery by researchers at the University of British Columbia has brought us one step closer to this becoming a reality. Researchers at UBC’s Okanagan campus in Kelowna found that coating small pieces of glass with extremely thin layers of metal like silver makes it possible to enhance the amount of light coming through the glass. This, coupled with the fact that metals naturally conduct electricity, may make it possible to add advanced technologies to windowpanes and other glass objects. The theory underlying the research was developed by Chau and collaborator Loïc Markley, an assistant professor of engineering at UBC. Chau and Markley questioned what would happen if they reversed the practice of applying glass over metal—a typical method used in the creation of low-e window coatings.